Hajdúszoboszló is located in the eastern half of Hungary, some 20km from Debrecen, on the North Great Plain. 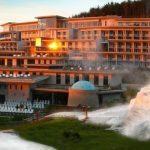 The city’s greatest attraction is its internationally famous health resort, the medicinal waters of which are particularly recommended for aching joints. The bathing complex contains covered medicinal baths, several open-air swimming pools – as well as a wave-pool and a spa-pool – for the visitors’ enjoyment. Since 2000 it also has an Aqua-park, with a variety of spectacular water-slides, for enthusiasts. The building of the thermal indoor spa was completely rebuilt. In the modern two-storey building therapeutic capacity has doubled. Four new pools has built, in which new services help visitors to recreate. These outdoor pools are surrounded by spacious corridors. In the big hall of the spa you can enjoy the basic spa cure in the indoor pools with different water temperatures (32 C, 36 C, 38 C). Later, the Thermal bath’s hall had been developed. 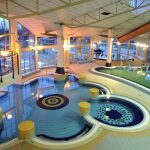 A new floor had built onto the Thermal bath, in which there are some new therapy rooms for the guests of neighbouring Hunguest Hotel Aqua-Sol. Downstairs left hand side you can find three consulting rooms and a gym for physiotherapy. You can rest in a separated park. Those with an aversion to natural ways of healing will surely change their opinion if they get treatments in the Hajdúszoboszló Medicinal Spa. 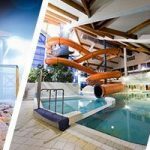 Keeping in view the pleasure of family recreation in the water, the Hungarospa Hajdúszoboszló constructed the first slide paradise in Hungary at its spa. Cause of the small capacity of the Aquapark, later the area had been expanded duble- width. It has 3 new slides ( Niagara, big hole, twister), so the whole lenghts of the slides are more than 1 kms. The indoor swimming pool is “next door” to the campsite and is open all day. It has an 8-track, 50 metre, streched surface pool with a water temperature of 25-27 C° and its water quality meets public health standards. With a cloakroom in the lounge and 600 cupboards in the changing room it awaits lovers of water sports. Here there are 2 gyms equipped for work out, and a restaurant in the lounge. The indoor pool is getting more and more popular at home and abroad as well. The city’s most valuable monument is the Calvinist Church; sitting on Gothic foundations – it is surrounded by the remains of its 15th century protective wall with its solitary bastion.